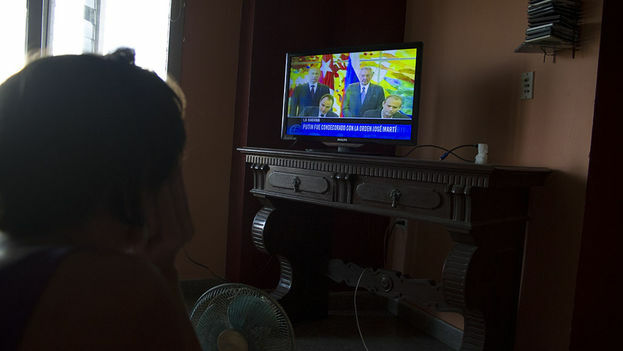 BlogAccueil » Blog » Putin In Havana, Seeking an Ally or a Satellite? Putin In Havana, Seeking an Ally or a Satellite? « These are the last sweets! » The cry could be the simple proclamation of a candy seller, but I heard it 23 years ago at my high school in the countryside and it was the first evidence I had of the collapse of the Soviet Union. The person shouting was Olga, a student who resold what the wives of the Russian technicians in Alamar gave her. She was the bridge between our Cuban money, worth less every day, and a series of products such as candy and canned goods « Made in USSR. » I remember this teenager, who warned us of the coming of shortages, like a blind Tiresias, alerting us to the adiós of the « bowling pins » (as we called the Russians). The old relationship with the Kremlin comes to mind now, with Vladimir Putin’s visit to Cuba. We have seen the official delegation on national television with its businesslike demeanor in suits and ties, no longer speaking of Marxism-Leninism or the dictatorship of the proletariat. They look different, but so much the same. The same glance from above they once had when they knew our island was just a small domino in the game of power. They come looking for alliances, to define the contours of those blocks they are reassembling — right before our eyes — in a new return of the Cold War. We are one step away from returning to our old status as a satellite, diminished before Moscow’s power, its oil, the debt relief it just granted us. Not a single official commentator has hinted at the dangers entailed in this approach, nor to the Russian government’s need to use Latin America as a diplomatic « launching pad » against its old enemy, the United States. In the midst of this renewed confrontation among the great powers, we are trapped as a disposable and negotiable part, as the case may be. The risk is such that I again remember Olga and the last Soviet candies she offered us in that dorm. Those sweets in extinction predicted an end, the goodies being announced today, like a new airport and possible Russian investment in the Port of Mariel project, compromise our future. You don’t have to be blind, nor Tiresias, to realize it. Click here for selected English Translations from Yoani Sanchez’s newly launched newspaper, 14ymedio. Behind the shelves there is another International Book Fair. One barely perceived among the partitions and walls of the exhibition areas. The national newspapers will never report on it, but these parallel and hidden events sustain the other one. A network of hardship, endless workdays and poverty-level wages, support the main publishing showcase on the island. For each page printed, there is a long list of irregularities, improvisations and exploitations. previous post: Is Cuba Already in Transition?